Once in a New Year's Eve Blue Moon. Where will I be tonight at midnight? If I can stay awake I will be out to see if I can get a peek at the New Year's Eve Blue Moon. The chances are not looking good, however. The skies clouded over late today and it's pouring! The term 'Blue Moon' has long fascinated me, and some years ago I did research to find out what it meant and where the saying "Once in a Blue Moon" came from. 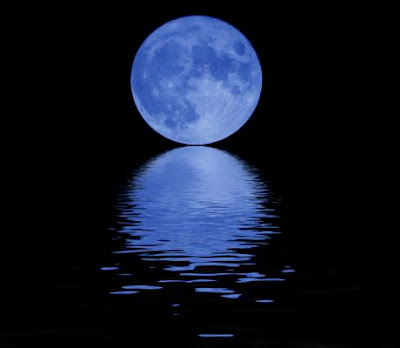 The most popular current definition of a blue moon is the second full moon in a calendar month. A full moon occurred on December 2 and tonight's will be the second, a phenomenon that occurs every 2.5 years (the next will be in August, 2012). But the New Year's Eve blue moon is more exceptional. The next won't occur until 2028. I wonder if I will be around to witness that one. Enjoy your New Year's Eve! We are having a small dinner party here at the house. I'm looking forward to it. Remember to take care of each other. It's important. Talk to you next year. Happy new years to you too ! may the upcoming year brings lots of happiness and blessings in your life. hope your dinner party goes great!